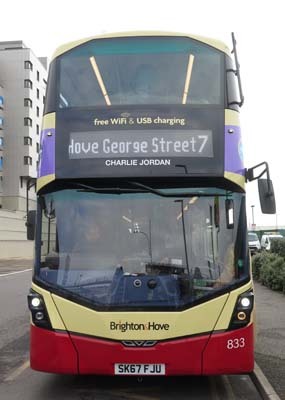 Connections with Brighton and Hove : Charlie Jordan, was a chaotic, inspiring, provocative community activist, a whirl of social innovation who dedicated his life to the improvement of other people’s. He was co-founder of the Emmaus community in Brighton and Hove and at the time of his death in 2009 he was working on establishing an Emmaus in Hastings. Charlie was born in Cape Town. He grew up in Durham and started to study law and fine art, finishing neither before becoming stage manager at the Mermaid Theatre in London. But his calling was community development. He studied youth and community work at Scraptoft in Leicester, taking a job in the early 1980’s Charlie came to Brighton to run Pact (People and Churches Together – now Impact Initiatives), which provided services for community initiatives in Sussex. With a deep commitment to social justice and the fight against poverty, Charlie initiated and nurtured a huge number of schemes in the Brighton and Hove area. These included the Hangleton and Knoll project, where local people run community services and buildings; Stopover, one of the first hostels for homeless teenagers; Workability, which enables people with disabilities to learn skills and find jobs; and Ask Here and Open Door, both of which provide advice, information and housing support for young people. Charlie possessed energy and talent for organising people to take control of their own lives and communities. He was brilliant at involving those labelled as disadvantaged or socially excluded in creating their own answers to problems. 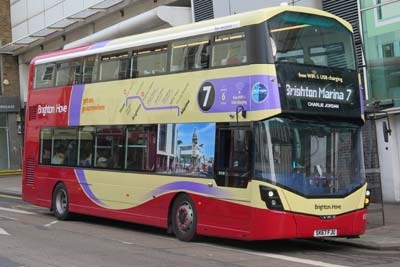 833 Mercedes Streetdeck on Route 7 - carried name since November 2017.